I have been asked a lot lately how I like my new job. I’m still in the training phase of it all but I think I really do love it. I don’t ever talk about what I actually do here on the blog but I can say that I like my small group of coworkers, what I do and what I’m learning. For the first time in a long time, I’m super happy to get up and go to work every morning. For a while, it was taking everything I had to get out of bed or not call in sick. It’s nice to get excited about what I’m going to wear today and knowing that my day will only bring something new for me to learn. This outfit will be featured on my We Heart This post for December (you can see my November post here) but this is pretty much what I’ve been wearing lately. A pencil or a-line skirt, patterned or colored tights and a sweater. It is suddenly winter in DC and Maryland and I hate it. I guess that’s what three blizzards last winter will do to you. I’m still adjusting to working, blogging and home schedule again so bear with me as I try to get everything in my life back in order. I’m sure after the holidays I’ll be back to my normal DWJ self but right now the darkness and lack of a good flash will keep me from outfit pics. Sorry! In the meantime, just check out the Gifts & Glamour Guide for a dose of holiday cheer. And you can always tell me what you’re up to, I’d love to hear! You can’t go wrong with an outfit like this. This seems to by my staple. 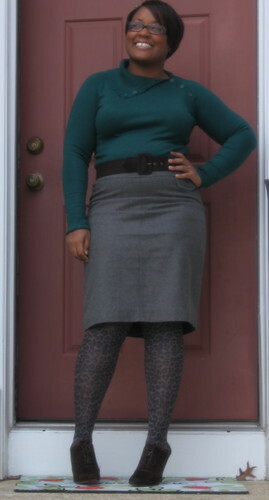 Nice sweater, a belt, a pencil skirt, and patterned tights. I mix up with boots and flats, but overall I feel comfortable. Once again, I am happy that you are happy. You inspire me! 🙂 If DWJ can handle a husband, a career, and a fabulous blog–I can, too! .-= Chandra @ShiftC´s last blog ..DIY Series- Rhinestone Tights =-. It’s great that you are now in a working environment that you enjoy. We spend so much of our time at work that when that is not the case, it can become quite depressing. I can 110% relate to “For a while, it was taking everything I had to get out of bed or not call in sick.” Thankfully, I am no longer in that situation and I hope to never be again. Best to you! I am LOVING this outfit! I too am trying to get back into the corporate world and if so, watch out world….I’m going to be shopping up a storm for outfits like this! .-= Courtney´s last blog ..Must Have Stackable Rings =-. Hoorah for jobs and coworkers we like! It’s so amazing what an impact that can make. .-= Ashe Mischief´s last blog ..Trashy Diva- Fab Footware in the French Quarter =-. I am loving those tights…. you kept the entire outfit so relaxed and then just hit us with the tights. Great job.